Aqua Aura Quartz pendent wrapped with silver wire. As these are natural products stones vary in shape and finish, all pieces are 1-2cm in size approx. Aqua Aura Quartz is created by treating crystals of natural quartz with an infusion of pure gold. The quartz is placed in a pressurised chamber at high temperature and exposed to pure vapourised gold. The resulting bond creates the rich blue colour called Aqua Aura. 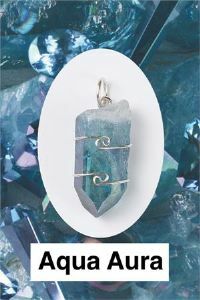 Mystic Lore: Intuitive sources say that Aqua Aura Quartz has an energy that can enhance one's intuition and communication, calm one's nerves, and energizes one's mental abilities. It is also said to help one's inner beauty to shine, and to attract wealth and success. The metaphysical properties of Aqua Aura Quartz have come from people’s intuition. You must use your own discrimination as to what is right and appropriate for you and your awareness.